Horses learn much quicker and are less likely to get confused, if you teach them in small steps rather than attempting a trick all at once. If you want to teach your horse a trick (or anything else), think about the final result you want, then try and break the trick into as many smaller parts as possible. Make sure that your horse understands each part thoroughly before you move onto the next part. 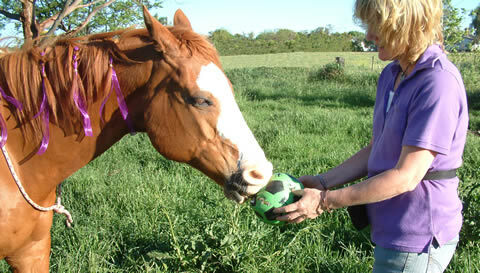 For example, if you want to start to train your horse to fetch a ball, you wouldn’t just throw it and expect him to go after it. If you spend a little bit of time planning the tricks before you start training it makes it easier for the horse to learn the trick. This is because you are clear about how you are going to teach your horse the trick and you are only teaching him small parts that he can understand easily. Think about your end goal, then write down each small step you are going to teach your horse to reach that goal. The smaller you can make each step, the better. If you break every new thing you want to teach your horse into simple small steps you will find that your horse will learn a lot faster and he will enjoy the training a lot more.